Hours: Time: 9:00 AM - Noon. Ages: 3.5 - 8 Years. 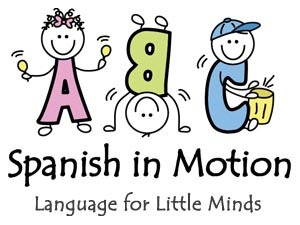 ABC Spanish In Motion is a Spanish program for little minds. We offer classes for children ages 0 to 9 years to aid future language acquisition and explore cultures through music and movement. The curricula includes common subjects such colors, numbers, shapes, routines, and commands, but also includes themes unique to Latin America, such as Latin rhythms, foods, countries, animals. Our Spanish summer camps provide an opportunity for children to begin to learn and practice Spanish in an immersive and cultural context. Children sing, make music, play games, craft, and prepare food as the themes change weekly. Children develop confidence and improve social skills through sharing and group activities in a highly social and participatory setting. - St. Johns Episcopal church. 27 Devons st. Charlestown, MA 02129 Wednesday to Friday from 9AM-NOON July 12th- Aug.18th - Kids 3.5-8yrs. - Amigos School in Cambridge. 15 Upton st. Cambridge. MA Tuesday to Thursday from 9'00am-NOON July 11th-Aug 17th - Kids 3.8-7yrs. - Discovery in Motion center 991 Boylston st., Newton, MA Monday-Friday from 9AM-3PM (Extended hours available) July 5th-Aug.25th - Kids 3-7 years. Week 1: Take to the Sea!/ ¡Vamos al Mar! : We'll play as pirates and learn about aquatic animals of the Americas. Little cartographers will study maps, learn about conservations, and be visited by live sea creatures from the Boston Aquarium! Week 2: Little Chefs / Pequeños Cocineros: Children will explore cuisines of the Americas, preparing authentic meals to be enjoyed during class. We'll learn about table manners and healthy habits, and the growth cycle as we plant legumes to watch grow through the summer! Week 3: Let's Go Camping! / ¡Vamos a Acampar! : This week’s “Campers” will enact outdoor activities and convert our rooms into natural paradises. We’ll also be visited by “wild” critters by curious creatures! Week 4: Carnaval / Circo, y Fiesta! : Get ready to party! We'll make and play instruments, and also explore the people, activities, and animals of a circus Dancers, musicians, and magicians will visit to help children put on a Carnival parade! Week 5: El Cambio de Colores en la Granja/ Changing Colors on the Farm: Well learn about the life and animals of farms throughout the Americas. Children will explore different climates, seasons, and furry farm-friends will pay a cute visit for all the children to pet, hold, and enjoy!